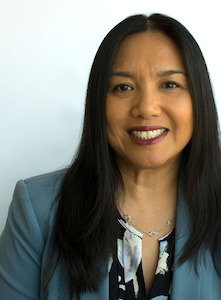 OAKLAND, Calif. –When Dr. Rowena Tomaneng was pursuing her doctorate at a southern California higher education institution in the early 1990s, everything seemed to flow smoothly. Or, so she thought. After all, Tomaneng had already earned a master’s degree in English literature and enjoyed a comfortable network of mentors that included several academicians of color. Also, she felt certain that a career in education and in teaching was her calling. But her doctoral studies came to a screeching halt – at least, for a while – when she drew scathing rebukes for her writings and for citing intellectuals such as bell hooks. Her remarks came last week during the annual conference of the Asian Pacific Americans in Higher Education (APAHE). Since its 1987 inception, the organization has developed programs and addressed issues impacting Asian-Americans and Pacific Islanders (AAPIs). It has evolved from a group of almost exclusively Californians into one with national reach. Unlike many academic meetings in this country, however, the APAHE conference remains distinctive for attracting quite a few undergraduates who not only attend, but also present papers and put on panel discussions covering myriad topics. This year, for instance, about one-third of the record 750 attendees were undergraduates. As one of very few Filipina college presidents nationally, Tomaneng shared some of her career ups and downs at the conference so that others, especially women, could learn from them and not feel alone when dealing with their own difficulties. Back then, Tomaneng joined the faculty of De Anza College and steadily climbed the ranks of the administration there. Eventually, she waded back into the waters of graduate school, landing in the University of San Francisco’s international and multicultural education program, where she earned her doctorate. Tomaneng wasn’t the only female conference-goer to recount emotionally hurtful experiences in the higher education realm. In a session titled “Sacramento State Hmong Women Rising As One to Reclaim Their Identities,” several panelists shared stories about how family elders too often doubt the motives behind young Hmong-American women pursuing college degrees. Because the Hmong are descended from farmers in countries such as Vietnam, Laos and Cambodia, the notion of a woman attending college seems unnecessary, perhaps even scandalous. For instance, Pa Vue recalled an uncle’s remark to her upon learning of her plans to leave the family home in Chico in northern California to enroll in graduate studies 400 miles away at the University of California, Santa Barbara. Panelist Susan Chang reiterated the negative stereotype that Hmong elders hold about college-going women when she shared her story with session participants. Because Chang unexpectedly became pregnant at age 17, she dropped out of college to get married and start raising a family. Years later, when she resumed her formal studies, “my husband was warned that I was going to cheat on him and that he would raise all our kids by himself,” Chang said, a catch in her voice from stifling tears. Chang is graduate lead mentor of Sacramento State University’s Full Circle Project, an initiative that aims to improve retention and graduation rates of underrepresented AAPIs – including Hmong. In more recent years, her frustrations tend to surface at local Chamber of Commerce meetings, It’s not unusual for her to raise her hand in an entire room of White men and, after being ignored for several minutes, speak up with her question or remark.